A flesh-eating parasite that has reemerged in the United States after more than a half-century has killed a fifth of the endangered Key deer on the Florida Keys since last fall. In January, a stray dog near Miami was successfully treated for these New World screwworm parasites, fly larvae that feast on open wounds in warm-blooded animals. Duerr talked with us about the history of screwworms in the United States and the implications of the Florida infestation. Screwworm is the larval state of the screwworm fly, known as Cochliomyia hominivorax. These flies feed on flowers and plants, but lay eggs at the edges of wounds on warm-blooded animals, including people. 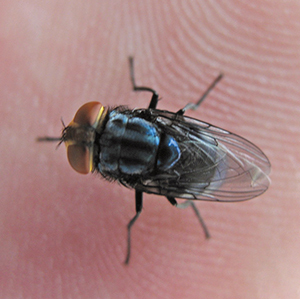 The flies can detect a wound from a long distance, and they release pheromones that attract even more flies. Hundreds and thousands of eggs can hatch into larvae that burrow into the wound. The wound can grow quite large because of this infestation and can be fatal if not treated—hence the fly’s Latin name hominivorax, which roughly translates as “man-eating.” Human cases of screwworm are rare, but they have occurred. This was immediately worrisome, because we have not seen screwworms there for more than 50 years. They were found regularly in Florida and the southern United States until the mid-1960s. During the summer months, screwworms could be found as far north as Nebraska and even Canada. It caused great expense to the cattle industry. Cowboys did more than move animals from place to place in those days; they treated wounds to prevent screwworms. While adult screwworm flies can travel long distances, they do not generally travel over open water. It is therefore likely that screwworms hitched a ride. I am afraid it is. Because wildlife are not monitored for wounds, these animals are more vulnerable. So far, 135 Key deer, from an estimated population of 700 to 800, have died from wounds associated with this parasite. 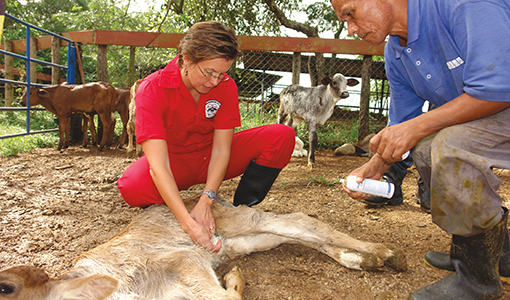 Efforts are being made to treat the remaining animals with an oral antiparasitic medicine.